Whether they love action, toys and playset, want to get creative with arts and crafts or snuggle up with soft toys, you’ll find all the latest toys and games featuring their favourite characters from Disney Pixar’s Finding Dory in our range. Dory is a wide-eyed, blue tang fish who suffers from memory loss every 10 seconds or so. The one thing she can remember is that she somehow became separated from her parents as a child. With help from her friends Nemo and Marlin, Dory embarks on an epic adventure to find them. Her journey brings her to the Marine Life Institute, a conservatory that houses diverse ocean species. Dory now knows that her family reunion will only happen if she can save mum and dad from captivity. Who is Dory of Disney Pixar Finding Dory Movie? Dory is a wide-eyed, blue tang fish who suffers from memory loss every 10 seconds or so. The only memory left was when she was separated from her parents as a child. To find them, she embarks on an epic adventure with the help of her friends Nemo and Marlin. The journey brought them to Marine Life Institute, a conservatory of diverse ocean species. Finding Dory Toys are perfect to keep your children occupied when you are busy with something. The children will absolutely love it, creating their own storylines and providing voices. 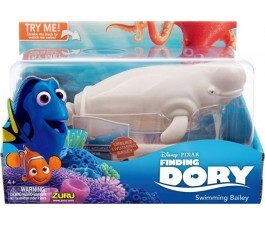 “I found Dory!” Visit our website, www.mrtoys.com.au and shop now!